The purpose of this article is to examine performance trends in overclocking the K6-III+ processor, in a similar approach as with my previous review, High-end K6-2 processors and overclocking. Officially, the K6-x+ processors were never meant for use in desktop computers; but then, such manufacturer party lines have little relevance in the do-it-yourself hardware community. This is good, as manufacturers often do not even know what kind of gems they are producing -- in the current computer market product turnover time is so short that manufacturers rarely have opportunity to fully explore the potential of their products. Also, for marketing reasons a manufacturer may in some cases avoid associating a product with a particular application. The task of discovering what lies beyond this information barrier then falls into the willing hands of enthusiasts, often resulting in applications and/or performance levels far beyond the launch-time product descriptions. The one drawback to this approach is that the final product descriptions read more like obituaries since the full potential of the hardware is recognized only after production has ceased. Hindsight has 20/20 vision and the most accurate picture of a given product is often obtained in retrospect. There remains a huge market of Super 7 boards possibly needing a CPU upgrade, and the following article is meant to separate fact from fiction in examining what kind of gains an overclocked K6-III+ processor can offer. I saw two ways to approach the subject, and have pursued both. This review will examine performance trends of the K6-III+ processor at various clock speeds, in a format similar to that used in my K6-2 article. Meanwhile, LostCircuits has simultaneously published a corresponding investigation that compares and contrasts the K6-III+ with the K6-2 at a more limited range of higher clock speeds. The standard disclaimer: The contents herein include information on overclocking the AMD K6-III+ processor. AMD does not condone running your processor beyond its rated parameters, and doing so voids any processor warranty and possibly the warranty of your entire computer system if such exists. As author, I emphasize that while I have overclocked a K6-III+ processor, such action can damage your processor, other portions of your computer system, and possibly cause other unspecified harm to person or property. The data herein are given solely for informational purposes, and the reader bears full responsibility for any results, including damages whether incidental or consequential, resulting from applying this information. I would like to acknowledge the generous contribution of MS, proprietor of LostCircuits, in providing the Shuttle HOT597 motherboard employed in the test system. For an understanding of where this board falls in the Super7 spectrum, consult his review. Additionally, he took time out of a busy life to proof-read my writing and make suggestions that furthered my technical understanding of the material, for which I am grateful. This article will discuss the K6-x+ processor line, raise points that any overclocker should consider, and then benchmark a test system. The histories of AMD and the K6 processor line were covered in my previous article, so here only the K6-III and the derivative 'Plus' processors are discussed. Readers desiring a more technical-oriented discussion should consult the LostCircuits article. The K6-2+ and K6-III+ processors are based on the original K6-III processor. The K6-III was a 0.25�m die featuring the K6-2 core but adding 256kB of on-die, full-speed Level 2 cache memory. On-die cache memory helped amend one of the Super7 platform's greatest weaknesses: A motherboard-resident L2 cache that could never operate faster than the processor Front-Side Bus (FSB). This factor had previously limited performance at higher clock speeds because L2 cache bandwidth could not increase except with an FSB increase, and even the best Super7 boards rarely ever made it past 112 or 115MHz bus. 120MHz were achieved on a few supporting boards and there are a few rare reports of successful 124 and 133MHz bus overclocks. The K6-III still uses the motherboard cache, but as a "Level 3" device after the processor's on-die L1 and L2 cache memories. 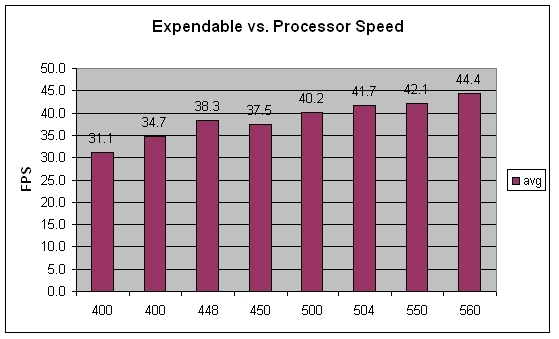 The K6 core did benefit from the cache upgrade and K6-III performance statistics were frequently better that those for an equivalently clocked K6-2, as was demonstrated by RoadRunner in a comparative analysis published by LostCircuits. However, the original K6-III was limited in that it was expensive to produce, ran hot, and did not seem to overclock well. Fortunately, around January last year, the advance of technology brought us the same CPU, without these problems: The K6-x+ processor line. The K6-x+ parts were essentially the K6-III die manufactured at 0.18� design-rule for lower power consumption and cool operation - with a pleasant side effect: Overclocking potential. Officially, the K6-x+ parts (K6-2+ with 128kB of cache, K6-III+ with 256kB of cache) were only a mobile offering, but hobbyists soon discovered that these K6-III-derived CPUs would work in many Super7 motherboards, and the resulting demand pulled large numbers of K6-x+ processors into OEM market channels. Most K6-x+ parts that entered into the channel were spec'd for 450MHz operation, but these generally clocked to 550MHz, if not faster. These are similar to those in my K6-2 article, but I have made modifications to specifically account for the K6-x+ series. (a) CPU cooling is critical. being 0.18� devices, the K6-x+ parts dissipate less energy than their older K6-2/K6-III brethren, which equates to cooler operation. However, they still require a fan and heatsink, and for the overclocker a quality cooling product is a must. Don't short-change your K6-x+ processor just because it doesn't get as hot. (b) Case cooling is important. Your processor heatsink is very inefficient if the fan only blows hot air onto it. High case temperatures also shorten the life of other peripherals, especially video cards and hard disk drives. (c) Do not overclock a laptop. File this one with such great axioms as "Do not put car keys into electrical outlets" and "Razor blades should be placed out of the reach of young children." K6-x+ processors can be found in several laptop products, but remember this: Laptops are designed for weight efficiency, yet some processor cooling method must be applied thus adding weight. A balance must be struck, and consequently many laptops operate near their thermal limits. An overclock could apply Very Bad Things to that expensive notebook. (d) Be aware of the 2x = 6x multiplier remap. Super7 boards peak at a 5.5x multiplier, but the K6-x+ parts continue the tradition inaugurated in the CXT-core K6-2: Set the motherboard to 2x, and the CPU will respond with 6x. You will need this in order to attempt the 600MHz (6.0 x 100MHz) and 672MHz (6.0 x 112MHz) clock speeds. (e) Know your core voltage limitations. 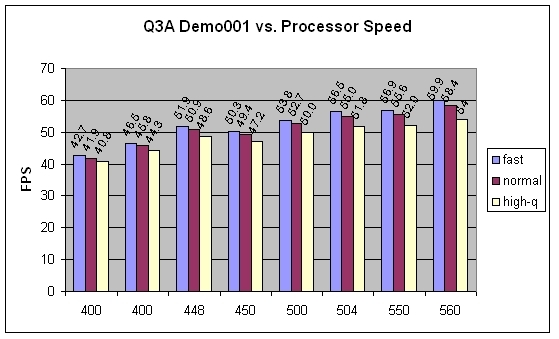 Processor core voltage tolerance decreases as design-rule decreases. All K6-x+ processors are spec'd for 2.0V operation, but as necessary, a higher setting can be used. I would suggest a good rule-of-thumb is that 2.2v and less are reasonably safe, 2.3v are okay but may have long term consequences, 2.4v are questionable, and 2.5v and higher are asking for trouble. This is subjective; others may disagree with my cutoff points. Regardless, use good judgement. A 0.2 or 0.3V increase is a lot for a 0.18� core. (f) Don't have unrealistic clocking expectations. As noted earlier, most K6-x+ processors will easily make 550MHz or higher. But, although there are many tales of 600MHz overclocks and upward, your processor may just not "take" at a given setting. Don't assume you are guaranteed xyz speed, and then go nuts on voltage settings trying to make it happen. Experienced users will recognize that performance-wise, this Super7 system is near its peak. Possible upgrades might include a larger hard drive or better soundcard, but the biggest benefit could be seen from replacing the Voodoo3 with a GeForce2 MX400 or similar. Note that this system configuration is not the same as that used in my K6-2 article, and results should not be directly compared. My LostCircuits article compares the K6-III+ and K6-2 processors in an all-else-equal test of this system. The 4.2GB system hard drive is divided into two 2.1GB FAT16 partitions. Drive C: hosts Windows 95 and a 256MB fixed-size swap file. DMA transfers are enabled for the hard drive. The SDRAM is set to CAS Level 2 in the BIOS. PCI Latency is set at 64 cycles. For assistance in understanding any of these BIOS settings, please consult the LostCircuits BIOS Guide. Seeing as how the advent of low-cost Athlon/Duron platforms has made high performance accessible even to budget-minded consumers, it is probably fair to say that a 'typical' Super7 user either cannot afford a faster machine, or is content with older and/or less-demanding applications. So, in establishing performance trends, it was desired to mix a variety of both older and newer applications with a few purely synthetic tests. Here I have included several gaming-based benchmarks but no business-application testing suite. Winstone numbers could have been obtained, but the program is heavily dependent on I/O latencies and the test system's slow hard drive would hinder the program. The K6-III's tri-level cache architecture offered notable benefits in applications heavily dependent on cached instructions and data. 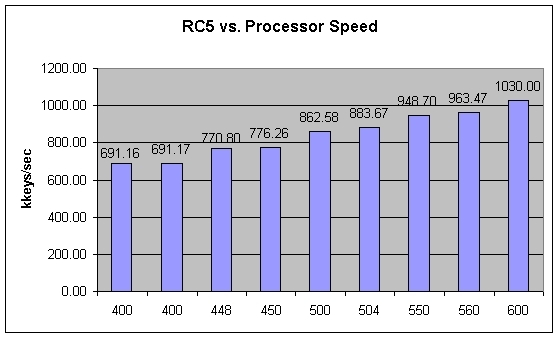 Prominent examples include the Winstone98 and 99 benchmark suites running mostly Microsoft Office applications, and in such an environment the K6-III held a distinct per-clock performance advantage over any other CPU as demonstrated by LostCircuits. The K6-III+ is simply an evolutionary step toward smaller die rules that reduce power draw and heat production; it is difficult to conceive that this design update would invoke any significant change in functionality or performance profile. My processor peaks at 560MHz, although I was able to boot to Windows at 600MHz and complete the three synthetic benchmarks. 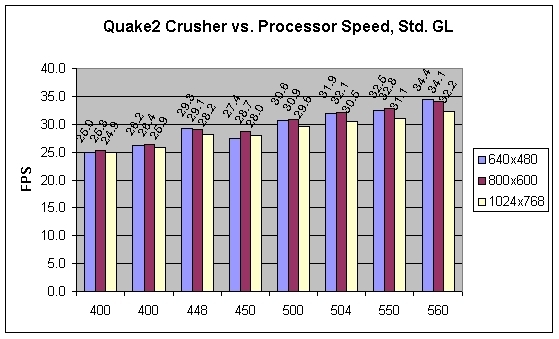 Note that in the bar graphs provided, the x-axis always represents CPU frequency (MHz). The first 400MHz speed shown is always the 6.0 x 66MHz setting, and the second is always the 4.0 x 100MHz option. In the y-axis, bar graphs show absolute scale; line graphs have been cropped in order to focus on relative differences. For all tests performed here, higher numbers indicate higher performance. 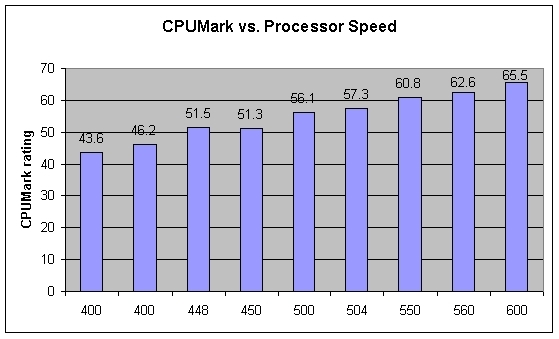 Synthetic benchmarks: This category includes Ziff-Davis CPUMark99, Distributed.net's RC5 64-bit encryption client, and SiSoft Sandra 2001se. These tools will provide a base for establishing general performance trends. Real-world: Included here are two older applications, 3Fingers' Quake2 Crusher demo and Rage Software's Expendable. Newer applications include Quake3: Arena's Demo001, the internal benchmark features of Synetic's Mercedes-Benz Truck Racing, and Bioware's MDK2 demo. Hybrid: This category has been included for it is the best way to describe MadOnion.com's 3DMark testing suite and the VNU/Remedy demo of Final Reality. 3DMark mixes demos with specific synthetic tests and then generates a score based on the results. Two versions have been utilized here; 3DMark2000, and the more resource intensive 3DMark 2001. Final Reality is older but operates similarly. These applications are presented in a sequence that roughly follows this order: Synthetic, hybrid, older real-world, newer real-world. RC5 is a client program for a Distributed.net project that was established in conjunction with an RSAA challenge to break a 64-bit encryption key. Here the RC5 client used was version v2.8009-460-CTR-00060723. RC5 results reported here are the average of six runs. 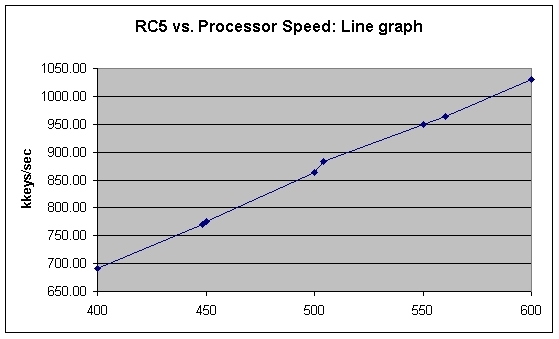 RC5 operates primarily "inside" the processor, and as shown here the results tend to scale evenly with processor speed. The scatter-plot is almost linear, although there are slight jumps at the 112MHz bus-based operating speeds. RC5 results scaled upward by 32.9%. CPUMark is a processor benchmarking utility, released by Ziff-Davis, which performs synthetic tests and then returns a 'rating' number. The numbers returned were consistent for any run at any clock speed. 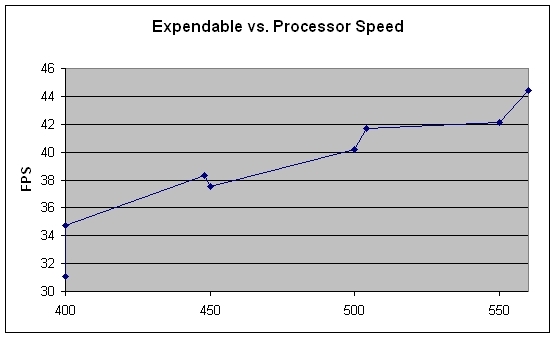 Note that operating speeds based on the faster 112MHz bus - i.e. 448, 504, and 560 - are rated as being slightly faster than 100MHz-bus based speeds. CPUMark increased by 33.4% across the range of tested speeds. These synthetic benchmarks are suggesting that CPU performance alone is scaling almost linearly. This is reasonable, since operation "inside" the CPU is determined purely by clock speed. However, as the hybrid and real-world benchmarks will show, once the system becomes dependent on a variety of factors and not just processor clock, bus speed will become a deciding factor. 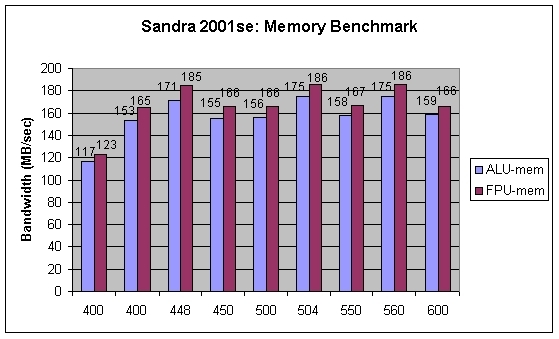 Sandra is a suite of synthetic benchmarks, and attempts to test optimal performance of a system. Results produced by Sandra have questionable value in cross-platform comparisons, but within a single system Sandra's tools can be useful for purposes of observing performance scaling. 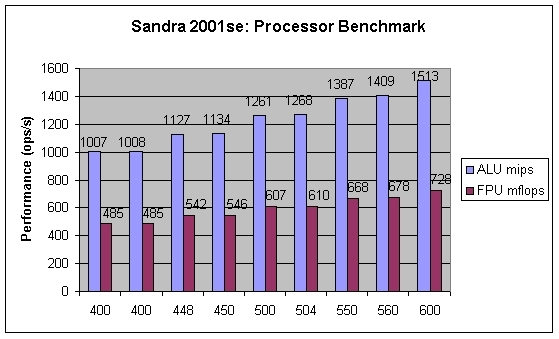 I have run two of Sandra's benchmarks: Processor and Memory. The Processor benchmark returned consistent results in multiple runs, but the memory benchmark was subject strange behavior. First-run results following a reboot would be values that I would expect based on experiences presented in my K6-2 article (which employed the older Sandra 2000 Standard). However thereafter the results would drop a few MB/sec in both ALU and FPU for each successive run. This I cannot explain, and have reported only first-run results for the memory benchmark. The Processor benchmark appears to scale according to actual processor operating frequency only. No spikes or other anomalies were observed, although the 66MHz bus speed was enough of a hindrance that the 400 (66) scores are just slightly lower than the 400 (100) results. Both ALU and FPU performance in the Processor benchmark increase by 33.4% across the range of tested clock speeds. The Memory benchmark shows, as expected, that the highest bus speeds have the highest bandwidths. This bandwidth will become a much more important factor as we progress into the hybrid and real-world benchmarks. 3DMark 2000 and 3DMark 2001 incorporate a mix of specialized tests and game demos tested at both low and high detail levels, based on Remedy Entertainment's MaxFX game engine. The program then generates a single score based on the results of these various tests. The per-test results can also be reported, but that degree of detail is overkill for our purposes here. 3DMark 2000, being a year older and DirectX 7 compliant, is naturally less demanding overall than the DirectX 8 compliant 3DMark 2001. With either benchmark, some tests required features not supported by the Voodoo3 and were thus automatically skipped. 3DMark by default operates at 1024x768 screen resolution at the highest supported 3D color depth. For the Voodoo3, this is 16-bits-per-pixel. The jumps at 112MHz-based operating speeds are made more obvious. 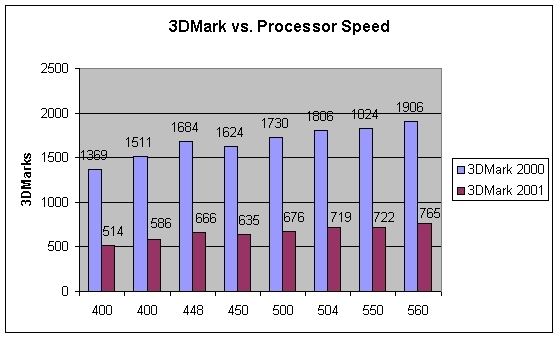 Although the system scores much higher in the older 3DMark 2000 as compared to the newer and more demanding 2001 incarnation, the increase between 400 (66) and 560MHz is pleasantly close - 28.2% for version 2000, 32.8% for 3DMark 2001. The discrepency between the 2000 and 2001 scores is primarily explained as a video card limitation; 3DMark 2001 requires a fully DirectX 8.0-compliant 3D accellerator (which as of this writing means an NVidia GeForce3) in order to score high marks. Without it, a number of 2001 features are being run in software emulation or skipped entirely. Note, though, that the scaled line graphs show nearly identical behavior, meaning that system performance is reaonably consistent under both benchmarks. Final Reality is an older Direct3D game. The benchmark/Demo version incorporates a mix of game landscape and vehicle motion, including flight, with 3D shape/effect tests. By current standards the game is not complex; texturing quality and animation detail are distinctly Quake2-ish, although Final Reality goes the next step and adds 3D reflections and some lighting effects, complex mathematical shapes with animated distortion, and a rudimentary fogging effect based on multiple transparency layers. The Final Reality benchmark runs at fixed internal settings and then returns a score in "Reality Marks". The familiar trend displayed by 3DMark shows up again, with clocks based on 112MHz posting small advantages. Final Reality results increased by 22.0% across the range of tested speeds. Expendable, the first of our real-world benchmarks, is an older Direct3D game in a third-person shooter format with an angled, overhead view. For eye candy, it incorporates numerous flares and other 3D lighting effects, as well as bump-mapped surfaces, although good artwork and layout are responsible for much of the game's visual appeal. Though not extremely demanding by Super7 standards, the game's internal timedemo feature is simple to use and returns consistent results. Expendable timedemo was run at 640x480x16, with all other settings left at default. Results are reported as Minimum, Maximum, and Average. I have shown only the 'Average' value is obviously the most significant. Again, it is readily observed that operating frequencies based on 112MHz bus continue to have an advantage. Here, this is due to the fact that Expendable is not a demo playback, as with many other games, but rather a command list of user inputs that the engine executes. In other words, character AI, item spawns, and so forth are being calculated on the fly; hence the program rapidly and alternately reads from and writes to the system memory, while placing relatively little load on the graphics card. Results scale 30.0% across the tested range of operating frequencies. Most persons are familiar with the look and layout of the Quake-series games. Suffice to say both Quake2 and Quake3: Arena (Q3A) are OpenGL-based, and the older Quake2 mainly uses colored lighting and transparent water for special effects. Most of the rendering is two-layer based. Q3A is much more complex, employing all the 3D eye-candy that we have become accustomed to in the past couple years, including reflections, flares and other 3D lighting-effects, and 3D fogging. For Quake2, Brett "3Fingers" Jacob's Crusher demo was employed. 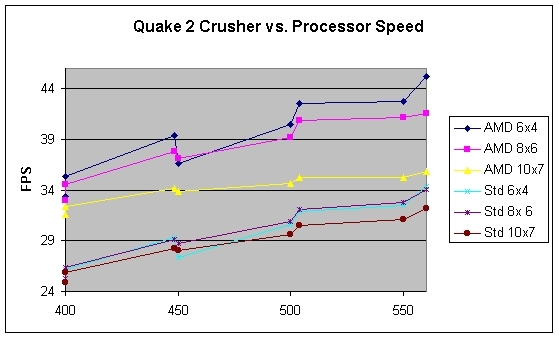 Crusher has been a popular benchmark due to being very resource-intensive, and returning highly repeatable results. 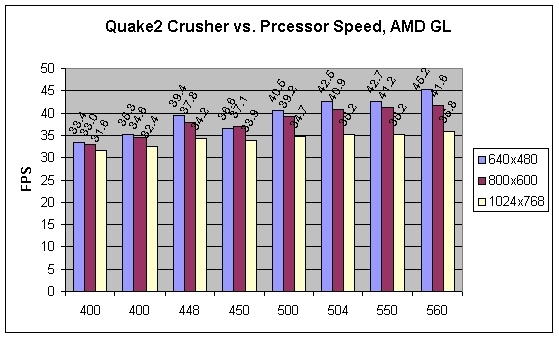 Testing was performed using both AMD's 3DNow!-optimized Quake2 OpenGL patch and the Default OpenGL renderer at 640x480, 800x600, and 1024x768. The 3dfx MiniGL renderer showed no improvements over the standard OpenGL setting, and was not used. All other settings were left at their default values. There is a technical explanation for this behavior, which has been included in the LostCircuits article. Summarily stated, without a renderer that can exploit the 3DNow! optimizations, the processor can only operate at about 25% of its maximum potential -- making screen resolution a negligible issue. Similar behavior as with the other real-world benchmarks can be observed. Bus speed is still a deciding factor, with the 112MHz-bus based operating frequencies scoring the highest results. Note that 400 (100) at High-quality is still faster than 400 (66) at the Fast setting. Now let us compare the Fastest setting to Fast. Both use the same 512 x 384 resolution, but the Fast setting uses more advanced visual options. While some of the more advanced graphics options employed in the Fast setting are dealt with more by the video card than by the processor, the Voodoo3 nonetheless scores far higher when paired with a faster CPU. This I can confirm from having formerly used it with my 800MHz Athlon (Thunderbird) system. 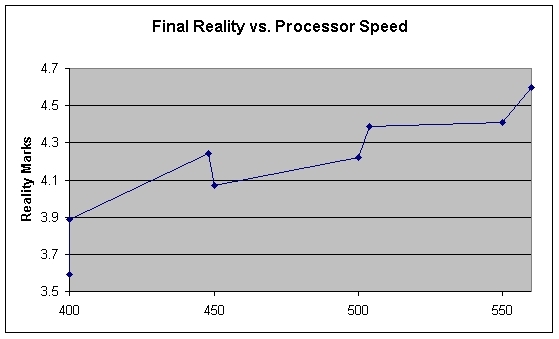 A maximum frame-rate difference of 8.4 fps is achieved between 'Fast' and 'Fastest', suggesting that more than anything, the system is limited by the CPU. This is to be expected; the K6-III+ is hardly a top-of-the-line part, although a timedemo result of 68.3 fps at 560MHz is nothing to sneeze at for the serious Super7 user. MDK2 is a newer OpenGL game that brings comic book-styled adventure to a first-person shooter format, although a third-person view of the main character is offered. The demo employs only a modest number of visual effects, mostly based around superb texturing and a few 3D lighting effects including shadows. However, judging by the smoothness of the game's many rotund surfaces, a very high polygon count is being employed. A 3dfx-specific driver and a default OpenGL driver are offered, but after discovering that that the 3dfx-specific driver returned results only slightly higher than the default device, I opted not to test it so as to remain consistent across all of the benchmarks used in this review. Save for disabling sound, all other settings were left at their default values. Tests were run at 640 x 480, 800 x 600, and 1024 x 768 screen resolutions. 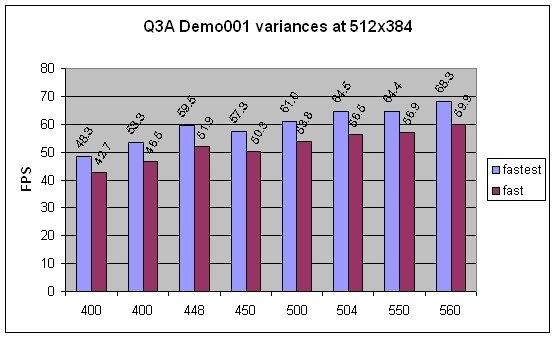 The benchmark automatically runs a short timedemo and then reports the average frame-rate. MDK2 is a little different from the other benchmarks; while bus speed still makes a difference, the game seems to prefer raw processor speed more than anything. 448 only slightly outperforms 450, and 504 does not bite at the heels of 550 as it does on many of the other benchmarks. Mercedes-Benz Truck Racing is a first-person racing game that simulates the thrill of driving a Mercedes-Benz freight-hauler cab, sans trailer, as fast as possible. This of course means that the vehicles liberally over-steer, so for the beginning racer most of the track-time will be spent either spinning or ricocheting. The game renders via Direct3D and employs some lighting effects including shadows, as well as transparencies and a high polygon count. Save for disabling sound, all settings were left at their default values, and the game was tested at 640x480, 800x600, and 1024x768 screen resolutions. The benchmark automatically runs a demo and then reports average frame-rate. 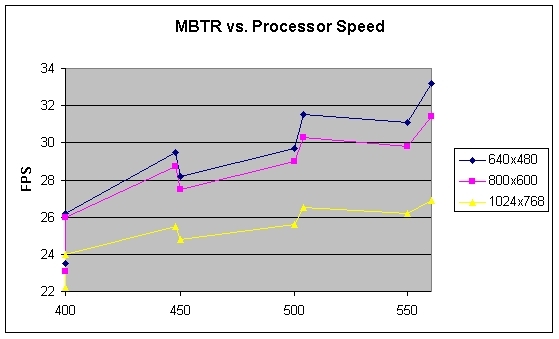 MBTR displays the same trends observed in the previous benchmarks, although this game seems to benefit more from bus speed: Note that performance at 504 surpassed that measured at 550. 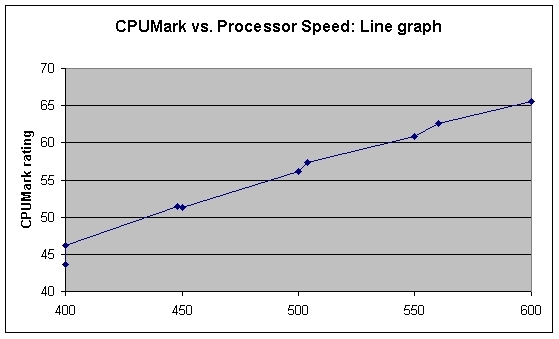 The synthetic benchmarks stated the obvious: Performance increases as the system clock speed increases. But these showed nearly linear trends, due to testing only one system element, i.e. the processor. 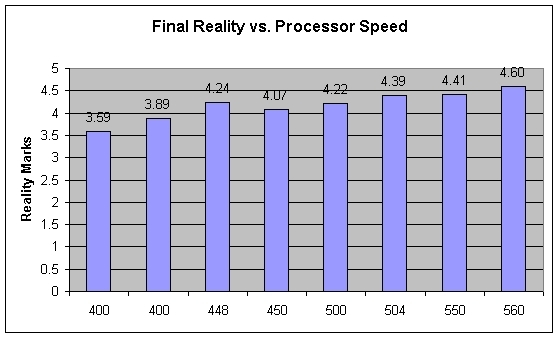 Real-world performance is dependent on more factors than raw CPU speed. As both the hybrid and real-world test demonstrated, bus speed is important. 112MHz bus-based processor speeds tended to equal, and in some cases outperform, faster operating speeds based on the slower 100MHz bus. The logical question would then be, why would a "mere" 12MHz make such a difference? The increase in bus speed breaks down three ways. First, the FSB, which refers to the transfer of data between the chipset Northbridge and the CPU, is increased. In addition to talking with the CPU and memory, the Northbridge also communicates with the PCI bus, the Southbridge, and by extension all system components. Second, data transfer between the Northbridge and the memory has also been increased. Third, the AGP interface to the graphics card is spec'd for 66MHz operation; at 100MHz, this is achieved by using a 2:3 divider. At 112MHz, the system is still using that 2:3 ratio, which means that the AGP interface is running at (2/3) * 112 = 75MHz. 3D games typically require much three-way data transfer between memory, CPU, and video card. Hence, even small bus speed increases can make observable differences in performance. Judging by the data returned in our testing, 112MHz bus-based overclocks are obviously preferable over nearby 100MHz bus-based operating speeds, although on some Super7 motherboards 112MHz bus may not be available. In such cases, 100MHz speeds generally are to be preferred over 95MHz bus or lower, as was demonstrated in my K6-2 article. The K6-III+ CPU's showing in most benchmarks was stellar if not spectacular, although the Q3A Fast and Fastest results were certainly acceptable for the user who is willing to sacrifice overall image quality for a smoother, cleaner-playing game. 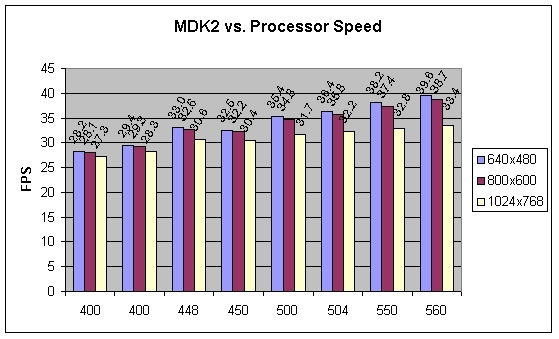 The lower scores in MDK2 and MBTR may seem unfortunate, but are to be expected for newer, visually complex games as the CPU simply cannot keep up with the mathematical demands that the software is making. Both games are still playable, albeit not so crisp as a fan of either game might prefer. To summarize, then, the K6-III+ is no barn-burner by modern standards, but for the Super7 user fortunate enough to have one such CPU, it is a reasonably fast solution with just enough horsepower to keep that older machine enjoyable for another year. For general questions and comments about this article, overclocking, or computer hardware/software in general, stop by the messageboard. For questions specific to this article, feel free to contact me with an email correspondence. Ace's Hardware - Although Ace's was not cited in this article, Johan De Gelas published an excellent article on the K6-2+, and Jasin Robertson later followed up with a second, briefer review comparing the K6-2+ with other Super7 platforms. 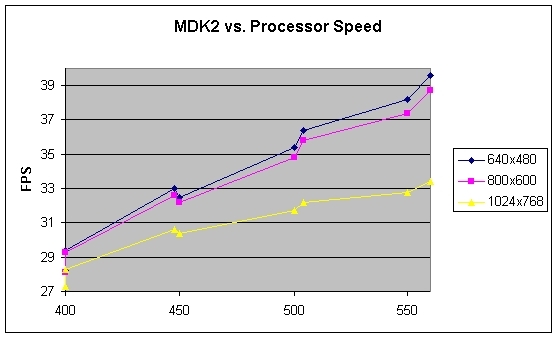 AMD - The place to find information and data sheets for the K6-III+ processor. The 3DNow!-optimized Quake2 patch can be downloaded here. AnandTech - Although also not cited in the above text, I suggest consulting this review because it examines both the K6-2+ and K6-III+ on a different hardware configuration, and includes several commercial office/productivity benchmarks. LostCircuits - A hardware-dedicated website with numerous reviews, guides, and "in-your-interest" articles by MS and other LC community members. Check out MS's review of the Shuttle HOT597 board employed in my test setup, and don't miss Roadrunner's comparison of the K6-III and the K6-2. Additionally, MS and Bighammer collaborated to produce a detailed assessment of the K6-III, and page five demonstrates the K6-III's advantage in Winstone testing. Questions about BIOS settings? The LostCircuits BIOS Guide probably has an explanation. Copyright Notice. All original information and presentation thereof - as well as the presentation of non-original information - contained herein is � 2001 by Aaron Vienot and may not be reprinted without the express permission of the same except in the form of brief quotations for citation purposes, news briefings, or reviews of this article. AMD, Athlon, Duron, K6-2, K6-III, K6-2+, K6-III+, and 3DNow! are trademarks and/or product names belonging to Advanced Micro Devices. Celeron and MMX are trademarks and/or product names belonging to Intel Corp. All other trademarks are the property of their respective owners. CPU-Central has been granted permission to freely reprint this article on the CPU-Central website.